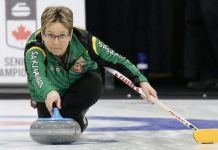 GRANADA, Spain (CIS) – Canada’s women’s curling squad got off to a strong start as competition began in earnest Thursday at the 27th Winter Universiade in the Andalusian city of Granada. The Ottawa-based squad of third Lauren Horton (Almante, Ont. ), second Lynn Kreviazuk (Ottawa), lead Jessica Armstrong (Ottawa) skipped by Winnipeg’s Breanne Meakin opened their competition with a pair of wins, edging South Korea’s Kim Eun Jung 6-4 before dominating Japan’s Mayu Manami 10-2 in the evening draw. For the Canadian men’s team out of the University of Manitoba, the start wasn’t what they had hoped it would be. Skip Matt Dunstone’s (Winnipeg) team of third Jim Coleman (Winnipeg), second Daniel Grant (Winnipeg) and lead Chris Gallant (Charlottetown) fell victim to a hot-shooting American skip in Stephen Dropkin. In a tight game that went down to the wire, the USA defeated Canada 6-5 with a tenth-end steal in the only men’s draw of the day. Elsewhere on the ice in Granada, the Canadian men’s hockey team made up of Canada West all-stars kept rolling, cruising to a 7-0 win over Sweden to improve to 2-0 in the tournament. Led by a two-goal performance by University of Alberta forward Jordan Hickmott (Mission, B.C. 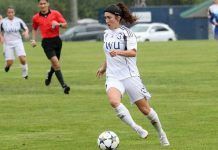 ), six different Canadians found the back of the net in a dominant performance, with Leroy, Sask. native Ryan Holfeld from the University of Saskatchewan earning the shutout with a 10-save performance. Canada (2-0) now faces Russia (2-0) for top spot in Pool B Saturday night, with puck drop at 5 p.m. local (11 a.m. ET), live on www.fisu.tv. Canada (2-0) wins 7-0 over Sweden (0-2); will play Russia (2-0) Saturday at 11 a.m. EST (5 p.m. Granada) in third and final game of the preliminary round.